Wonderful ocean,whitewater & sand balcony view. About 100 steps from sand. 200 foot wide sandy beach with lifeguard station. Surfing area, marina next door with half & full day fishing boats,or take an excursion boat to Catalina, or sip coffee at one of the coffee spots & restaurants. Take a 10 minute walk to the pier. Fishing allowed. Next to Marina with shops and restaurants, or choose from the variety of restaurants along the coast. Within easy distance of Del Mar race track & some of the finest golf courses in the world. Near Legoland and Wild Animal Park(San Diego Zoo). Facility features Hawaiian feel with waterfalls, beautiful pools, sauna, barbeques, jacuzzi's, coy fish pond, streams, etc. Right on the sand. An exquisite setting. Unit is fully equipped and furnished including full kitchen, microwave, dishwasher, cable TV'w with DVD's. Gated and patrolled facilities with underground private parking. community room - close by - need to use coins. auto matic --- can not use wood or anything. complex is in a tropical setting w/ many steams, waterfalls and koi fish. can rent elsewhere; have a storage assigned by office. Linens provided, 2 heated pools, 2 jacuzzi's, Private parking space in covered garage, Private balcony, Two bedroom two bath unit has two private balconies, see ID listing 35352 Cable TV, Sleeps six in King size bed, queen size sofa, and private bedroom suite with bathroom and double size sofa and twin bed. I could see the ocean from the balcony of this condo or walk 1/2 a block to enjoy the beach. I never worried about my safety at the complex - 24 hour security plus locked gates. It felt like visiting an old friend - everything I needed was at the condo. I especially liked that I didn't have to use the stairs, the elevator to the parking garage was steps away. The complex is beautiful and kept spotless. This property was close to the beach as stated. It was clean and very comfortable. Right on the Beach-perfect spot for great price! Really loved our experience at this condo. The view was great from the balcony and it really was steps to the beach. Would stay at this place again. The owners were very accommodating and helpful. Everything we needed was in the condo. There are things inside that could be updated such as current listing of restaurants and purchase of new boards, but who really cares about these small things. 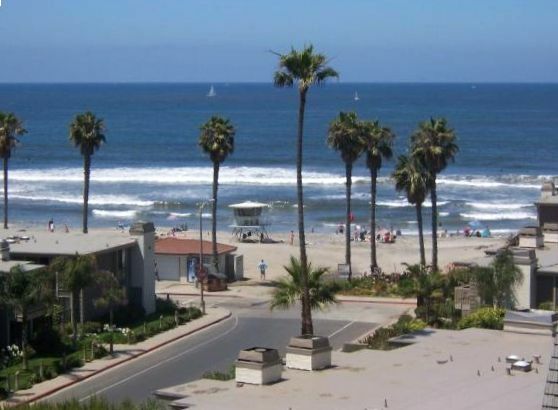 If you are looking for a more inexpensive place in Oceanside right on the beach-this is the place. Would highly recommend! Thanks for great stay. My husband, 9 month old daughter and I stayed for 12 days. The owners were a pleasure to work with and the condo was great! I vacationed in Oceanside at North Coast for several years growing up and this was a wonderful return with my family. Great beach access, charming condo -- relatively kid friendly. Kitchen was pretty well-stocked, great since we cooked most meals in. Quiet, great views. Couldn't have asked for more for our dollar! I would love to come again!! My wife and I recently stayed in this unit and had a great experience. Renovations have been helpful, location next to and overlooking the beach and pier area is phenomenal. Outdoor barbeques for the units was helpful, the unit was well stocked with equipment, furniture and kitchenware. Walkway along the water right outside the unit, extending beyond the pier, is a real plus. Beaches are great, location is near a lot but off the main flow of traffic and most noise. Owners were very helpful and informative on local highlights. We are already missing our time there, and would definitely rent it again as we enjoyed the unit and love Oceanside area. I made a last minute decision to visit my son at Camp Pendleton. I found the rental by accident surfing the web. What a wonderful find. The owners were great to work with, especially at the last minute. They were helpful and gracious (I decided at the last minute to stay an extra day and they were very accommodating). I had a wonderful view off the balcony, and was just steps from the beach. I will definitely be back. Thank you for an enjoyable vacation with my son.